Plunge the Depths (outside) getting his nose in front of Hellofablast at the wire to set the top time for the Open Graduation Stakes. 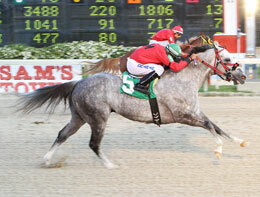 VINTON, LA�JUNE 7, 2013�Coming off a victory in the Sam Houston Maiden Challenge last month Plunge The Depths defeated Hellofablast to set the top qualifying mark in the Open Graduation Stakes at Delta Downs on Friday night. The 10 fastest qualifiers from the three trials will return to the Louisiana racetrack on Friday, June 28 and vie for the winner's portion of $45,460 purse over 350 yards. Conditions for the trials were maiden 3 and 4-year-olds as of March 1, 2013. Under jockey Ricardo Aguirre, Plunge The Depths put in a late surge to the get the top qualifying mark of :17.585 seconds, a 90 speed index. After going 0-for-5 at two and three, Plunge The Depths has not lost a race this year. He kicked off his four-year-old campaign by setting the fastest time for the Sam Houston Maiden then returned to the win final. Willie Simien, Jr. conditions the Wave Carver horse for owner Julio Cesar Ramirez. Joe Kirk Fulton is the breeder from the Strawfly Special mare Miss Monolo. Plunge The Depths has earned $28,132. Simien also saddled fifth fastest qualifier Fire On The Fly.